Vote Trading – A Prophesy for the Elk Grove City Council? Elk Grove City Council watchers are not often taken aback by comments from the dais during council meetings. We have pretty much heard it all including when seeking an appointment to a board, one former council member stated, “We don’t want some housewife!” Another former council member threatened to withhold grant money because a citizen dared to exercise her First Amendment Rights. Even worse, a former council member stated that the CFO of another government agency was “misappropriating taxpayer money.” However, when it comes to inferring that members of the Elk Grove City Council may break the law if the voting system is changed is another matter entirely. At the December 9th Elk Grove City Council meeting at the onset of Council's deliberation regarding the possibility of the city of Elk Grove changing to a by district voting system, the discussion immediately soured with the comments regarding the illegal actions of “vote swapping." The actual term is “vote trading.” Was it a prophesy? Has vote trading already been occurring? 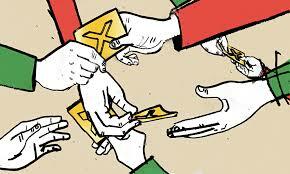 What about vote buying? After all, who gives one council member $10,000 and then shows up at a council meeting, speaking at public comment for the first time wanting to change a major ordinance? And then this same developer who dumped tens of thousands of dollars into the council's coffers and low and behold, not only does the developer get a rezone, but the key ordinance is changed. What is most important here is not the people who give money to garner favor for their project and/or contract, but the people who entrust the city council with their vote. With the comments made at the last council meeting, let’s hope that the majority members have not lost sight of their real purpose on the city council. Let’s be clear here: Vote trading is a felony! Please click on the link and read the article published in “Western City,” the monthly magazine of The League of California Cities of which the city of Elk Grove is a member. To wit: “Any member of the legislative body of a city, county, city and county, school district, or other special district, who … gives, or offers or promises to give, any official vote in consideration that … another member of the legislative body … shall give this vote either upon the same or another question, is punishable by imprisonment in the state prison for two, three, or four years and … by a restitution fine of not less than $2,000 or not more than $10,000. After all, one council member opened the door here and was that a forecast for the future? Is this how the rest of the Council feels? And finally, as stated, if the city of Elk Grove does change to by district voting, would the majority of the Elk Grove City Council only represent the constituents in their respective district? I think not. To compare the county of Sacramento's by district system as a mirrored example of the city of Elk Grove's future was absurd, and this case -- "good silence would have been better than a bad argument!" Connie, thank you for your thoughts. I'm not a psychologist and I don't have a fancy Latin name for what I see on this Council, but I will call it the Big-Head Syndrome. Because a wad of cash was put into their pockets by "stakeholders" to secure a consistent voting pattern, they now all of a sudden have these delusions of grandeur that they are the new breed of grand american statesmen. This fair city deserves better-the residents deserve better-the hard working small business owners who can't afford to hobnob with the Chamber of Commerce clique all deserve better from their statesmen. We expect more from these characters whether we are in attendance at their meetings or not. In the tainted haze of numerous FPPC violations, empty promises, and reckless spending, how appalling it is to hear our leaders stoop even further to argue that questionable voting behaviors may happen if full democracy is implemented. Our leaders underestimate our intelligence and do not see the clock ticking against them and their remaining time in office. It should come as no surprise that Detrick would be willing to commit a felony with regard to his votes as a sitting council member. He has already demonstrated his propensity to ignore the law. He violated campaign finance laws once, twice, no wait three times and possibly four. And is it possible, in light of his comments regarding vote trading, he just admitted that his vote can be purchased? Gil Moore's AM/PM Mac Attack monstrosity perhaps? Yes, Detrick has really become a detriment to this city. His actions have been proven illegal and unethical on more than one occasion. He has never taken accountability or responsibility for these actions. - Time for him to go. Would someone in his district please stand up and run against him. I guess my question would be "why did our councilmembers thought process even go to vote trading/vote swapping in the first place"? Having lived previously in a community with a by district voting system I found it to never be a problem. They may have represented us by district, but never forgot they represented the city as a whole. So it would seem to me that we already have a hugh problem in the works and need to do some cleanup.